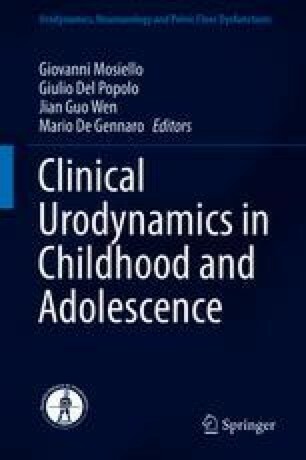 Urodynamic studies (UDS) have become a major tool in evaluating lower urinary tract dysfunction in children with neurogenic or non-neurogenic bladder. Lower urinary tract dysfunctions (LUTD) in children frequently occur in combination with other disorders of the lower part of the body. By definition of the International Children’s Continence Society (ICCS) standardization paper on LUTD in children , any item that gives information on the function of the urinary tract and the bowel is part of UDS. Tekgul S, Dogan HS Hoebeke P, et al. EAU guidelines on Pediatric Urology 2016: European Society for Paediatric Urology and European association of urology. uroweb.org/wp-content/uploads/22-Paediatric-Urology_LR.pdf.